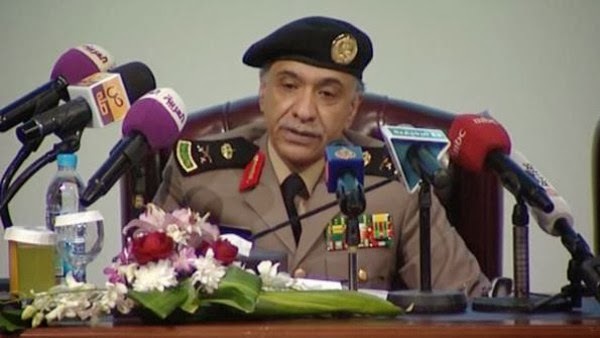 Gen. Mansour al-Turki, spokesman for the Saudi Interior Ministry, says the amnesty period for illegal workers has ended and a security campaign will take place all over the kingdom. The Saudi Ministry of Labor announced Sunday that the time for illegal workers to leave the kingdom will end Monday, however Syrians will be given special consideration due to the war in their country. On April 3, Saudi Arabia announced a three-month amnesty for illegal workers to leave, later extending the period to four months. “We have absolutely no intention of prolonging the amnesty,” the ministry’s spokesman Hattab al-Anzi said in a press conference. However, “the ministry does not intend to organize campaigns to inspect homes with the help of women officials,” Anzi added. The official said expatriates and citizens have the right to stop inspectors from entering their homes. The ministry, meanwhile, has warned those who shelter illegal workers and said they will be given a two-year sentence in prison, pay 100,000 riyals ($26,665) or both. The ministry also urged violators to continue attempting to “correct” their illegal statuses given that they are not arrested. Turki added that the arrested violators will be put in detention centers until they are deported. More than 2.4 million labor law violators have managed to escape penalties and transfer their residence visa during the grace period while around 900,000 managed to renew their expired visas.